Tonight I put on a silly hat and journeyed forth with a friend to wander the streets of the East Village. And once again I was reminded why New York City on Halloween is such a great place to be. But the East Village is safely far from the corrupting effects of commercial attention. It’s just a lot of people wandering about wearing silly and wonderful costumes, enjoying each others’ company on a magical night. I think about the paradoxical quality of Halloween in “Buffy the Vampire Slayer:” It’s the only night of the year when all the demons stay away from Sunnydale. Halloween is like that for me. For one glorious evening we can put aside thoughts of the real scary monsters, like you-know-who and his best pal in Moscow. On this evening we are all simply children playing dress-up, smiling at one another as we indulge in the fantasy of safely make-believe monsters. Tomorrow we will again take up the good fight. But tonight we enjoy the innocence of childhood, and the joy of seeing a smile on a happy stranger’s painted face. I’ve notice in recent conversations here in New York City that many people manage avoid saying a certain well known name, by substituting the phrase “The Idiot”. Everybody knows exactly who is being referred to, but avoiding the actual name seems to reduce the general stress level. In addition to stress itself, there are a various other related emotions at play right now, including fear, anger, disgust and disbelief. And all of these are adding to the general level of stress. Strangely, people don’t need to check with each other about this. They just spontaneously say “The Idiot” and everything is understood. It’s nice to see people agreeing on something. I was thinking today about Gumby. In particular, how Art Clokey’s magical creations, Gumby and Pokey, had the ability to change their form at will. They could transform into the appearance of any other creatures, roll up into a ball, flatten themselves into a sheet to scuttle under a closed door, and perform other feats of morphological legerdemain available only to beings made of clay. But today, as I thought fondly of Gumby and his superpowers, my thoughts drifted to a different yet oddly related cultural phenomenon: The T9000 from Terminator 2. When that film was released, the spectre of Robert Patrick transforming himself at will was truly terrifying. Nobody was safe from such a fearsome enemy. 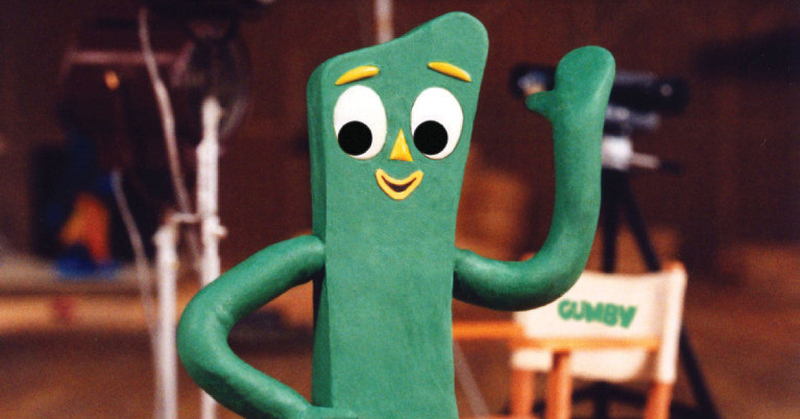 I found myself imagining Gumby as the foe of Sarah Connor, a deceptively friendly looking assassin. To the untrained eye, he is a goofy plaything made of clay. But to the initiated, he is revealed to be a highly sophisticated weapon from the future, a deadly robotic swarm, composed of millions of tiny nanobots. There is some perverse part of me that wants to see that film. Join me as we watch with fascination and mounting dread as Sarah Connor bravely defends humanity from The Gumbinator! Some years ago my cousin took me along to a party. His friend who was throwing the party was very well read, and there was a large bookshelf lining one wall of his apartment. At some point, several beers into the evening, a guy at the party and I started to get into a debate about computer graphics. I was describing how a particular procedural texture algorithm works, and this guy was saying I had it wrong. It was all a bit awkward, because I was describing my own algorithm, but I could think of no graceful way for me to say that. Until, that is, I spotted a book on the shelf that I had co-authored. I casually pulled the book off the shelf. “Look,” I said, turning to the relevant page. “you can see right here how the algorithm works.” It definitely helped my argument that my name was on the cover of the book. Every once in a while you get lucky. The neighborhood, Squirrel Hill, where eleven people were killed today while at Saturday morning services in Pittsburgh is the very same neighborhood where my brother and his family live. On Saturday mornings my brother and his family go to the next synagogue over. My relatives are ok — and yet, there but for fortune. A lot of people have been pretending that the dark and violent rhetoric of a certain occupant of the White House is of no consequence. But it is of consequence. Crazy people like the Florida bomber and the Squirrel Hill shooter don’t need much of a push. Not that long ago, we lived in a country where people at the top didn’t promote violent bullying, didn’t publicly praise people who body-slammed journalists, didn’t brag that they could shoot someone on Fifth Avenue and get away with it. Don’t kid yourself, things could still get a lot worse. And we’re not talking about differences of policy here. We are talking about a fundamental question of human decency. So ask yourself this — what sort of country do you want to live in? Then go out and vote. Some of us were talking yesterday about things that might be possible after everybody is wearing mixed reality glasses. The conversation touched on how we divide people into two categories: (1) People who are our friends and family, or are otherwise in our “tribe”, and (2) Everyone else. We intuitively recognize the inherent humanity of people in the first category. We empathize with them, and generally have a great capacity to be nurturing and supportive toward them. People in the second category, like the people we might encounter on the subway, tend to become a sort of blur. Intellectually we know that they have as much individuality and humanity as the people we know, but that fact does not always register with us on an emotional level. Somebody in our conversational group suggested that we use our future wearables to map the faces of our friends and family onto the faces of the people we see on the street and in the subway. Whichever person we know who most resembles a particular stranger, that is the face we would see when we look at that stranger. If we did that, maybe we would all be kinder to the people around us. In a few years it should be possible to try, and the we’ll know whether it works. Imagine you are back in 1968. It is the era of free love, of mass protests against the Vietnam War, of young people marching for civil rights. Somebody comes up to you and says that they can give you Captain Kirk’s communicator. You can carry it in your pocket, you can use it to call your friends from wherever you are, or instantly look up any known fact in the Universe. It can even display a map that shows where you are, and tells you how to get to where you want to go. Of course such a technology would be wildly beyond what you are used to. It would all sound like a fantastical vision from centuries in the future. This morning I attended the grand opening of the new RLab at the Brooklyn Navy Yards. Very exciting!! I had to leave a bit early to race back to Manhattan for a meeting. The timing was so tight that I didn’t have a chance to grab lunch. Which is how I found myself stuck in a meeting with no snackage in sight, and a growing feeling of hypoglycemia. To take my mind off my predicament, I opened up my laptop and started working on a program I’ve been developing. Hopefully everybody else at the meeting assumed I was taking notes. Interestingly, I found that in my state of low blood sugar, it was very easy to program some things, but nearly impossible to program other things. Anything that was straight up coding logic was easy. But anything that involved building any sort of non-trivial data structure was hopeless. Now I am wondering how this translates into the different ways we use our mind while engaged in any procedural task. Clearly the part of my mind that solves logic puzzles was unaffected by my brain’s feeling of distress. But for any task requiring real decisions to be made, my hunger-distressed brain becomes inoperable. The experience reminds me of how it feels when I improvise on the piano. Certain tasks, such as spinning out a melody or a chord progression, are right at my fingers tips — my hands pretty much just play on their own. But other tasks, like a meaningful set of shifts in musical tone, require conscious attention and active decision making. I guess the lesson here is to remember to avoid computer programming and playing in jazz bands before lunch. I was scheduled to give a talk about our research in the early afternoon to a business group that wanted to learn about the future of AR. Which wasn’t a problem — I like giving talks. But then a colleague called me up with a last minute emergency request: Her guest speaker had fallen ill, and could I give a talk to her class about our research? I know how difficult these situations can be, so I said yes. So two talks for two very different audiences, back to back. Then this evening, shortly after the second talk had ended, it was time to teach my graduate class. It’s a great class, with students who are all doing very interesting work. Which I think is what saved my poor overworked brain. After such a long day, I was quite happy to spend two hours not needing to do anything but listen to somebody else talk about their research. I just let the students present their projects, while I listened appreciatively, making the occasional constructive suggestion. I am not sure the students realized just how appreciative I really was. I was at the theater this evening with a friend. We had very good seats, near the front. Although the play is very popular, surprisingly the two seats next to us were empty. I told him that was impossible. “Why?” he asked. You are currently browsing the Ken’s Blog blog archives for October, 2018.